Back cover blurb: Two girls go missing, decades apart. What would you do if one was your daughter? Eight-year-old Grace is last seen in a sweetshop. Her mother Emma is living a nightmare. But as her loved ones rally around her, cracks begin to emerge. What are the emails sent between her husband and her sister? Why does her mother take so long to join the search? And is there more to the disappearance of her daughter than meets the eye? Meanwhile, ageing widow Maggie Taylor sees a familiar face in the newspaper. A face that jolts her from the pain of her existence into a spiralling obsession with another girl – the first girl who disappeared… This is a gripping psychological thriller with a killer twist that will take your breath away. 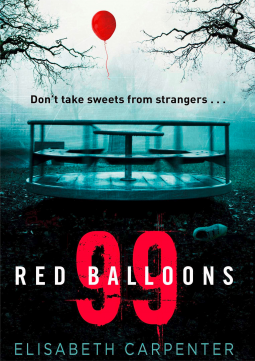 You and I in a little toy shop, buy a bag of balloons with... sorry, every time I see the cover of this novel, I can't help singing 99 Red Balloons. Guess I've given away that I am a child of the 1980s now!! So erm, anyway... back to the novel. What can I say about 99 Red Balloons that won't give too much away? Hmmm. It is one of those novels that is really tricky to review without spoiling things for those who haven't yet had the pleasure of reading, but I will try. Eight year old Grace is last seen in a sweet shop (that's sweet shop, not toy shop;)) moments before her disappearance. Her Mother Emma, had only just started letting her walk home from school with her friends, but was still keeping a watchful eye on her from a distance-the school only moments from their family home. Now Stephanie, Emma's sister is trying to keep the family together as the Police begin their search, and their surveillance and scrutiny of the family - always the first to be suspected of wrong doing in such a case. Meanwhile miles way Maggie Taylor is keeping a keen eye on the news. Poor Grace's disappearance brings back memories of her daughter Sarah's loss of her five year old Zoe, years and years before. There is nothing to link the cases, Zoe is presumed dead, though her body never found. As Grace's family begin to fear that the worst had happened to them too, there is a sighting of Grace with a stranger that nobody recognises.... or so they say. As the investigation deepens, some of the family members begin acting oddly, and as Stephanie tries to keep everyone sane, she begins to wonder if some people know more than they are letting on. 99 Red Balloons has some brilliant, yet flawed characters. It is a gripping read and comes highly recommended! 99 Red Balloons is available from 24 August 2017.